Islamic scholars have divided Islaamic Learning into three major subjects: At-Tawheed (Eemaan), Al-Fiqh (Islaam) and Tasawwuf (Al-Ihsan). At-Tawheed is regarded by most scholars as the first and most important subject in Islaamic learning because it teaches about Faith. At-Tawheed to children of all ages. It consists of 25 fully illustrated books, 25 themes, 1,200 pages and 550 coloured illustrations. The Qadhaak and Qadar (fate and destiny). A number of pre-schools, kindergartens and schools are using Teach Your Child Islaam At-Tawheed Series to teach Islaam to children to give a clear direction and it makes learning fun and easy. 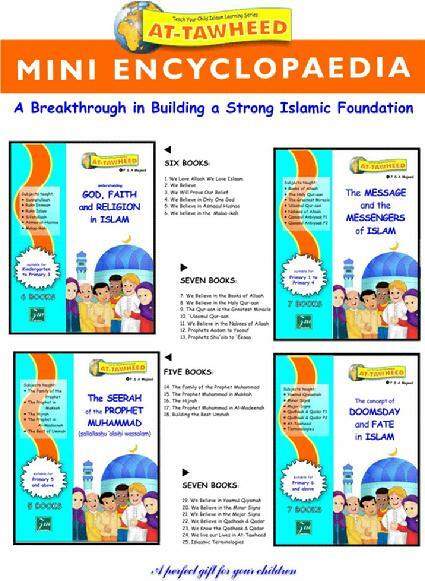 Children who have read this Mini-Encyclopaedia will have a good understanding of Islaam as a religion and a way of life. They will grow up having a firm foundation of faith, inshaa Allaah. Teach Your Child Islaam At-Tawheed Series has been approved by the Islamic Religious Authority in Singapore (MUIS) and in Malaysia (JAKIM). Teach Your Child Islaam At-Tawheed Series consists of 25 fully coloured books and is priced at USD186.00 (SGD250.00/RM625.00) only. "I am confident that this series will receive the support of the scholars and the Muslim community because it will assist the teachers and parents to instill faith in our children, inshaa-Allah"